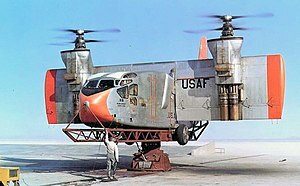 The Hiller X-18 was an experimental cargo transport aircraft designed to be the first testbed for tiltwing and V/STOL (vertical/short takeoff and landing) technology. Design work started in 1955 by Stanley Hiller Jr and Hiller Aircraft Corporation received a manufacturing contract and funding from the U.S. Air Force to build the only X-18 ever produced, serialled 57-3078. To speed up construction and conserve money the plane was constructed from scavenged parts including a Chase YC-122C Avitruc fuselage, 49-2883, and the turboprops came from the Lockheed XFV-1 and Convair XFY-1 Pogo experimental fighter programs. The tri-bladed contra-rotating propellers were a giant 16 ft (4.8 m) across. The Westinghouse turbojet engine had its exhaust diverted upwards and downwards at the tail to give the plane pitch control at low speeds. Hiller nicknamed their X-18 the Propelloplane for public relations purposes. Preliminary testing occurred at Moffett Field Naval Air Station, CA. The first flight (hop) was on 11/20/1959 followed by the first real flight on 11/24/1959 with Hiller test pilots George Bright and Bruce Jones. Further test flights were held at Edwards AFB, ultimately recording 20 flights. A number of problems plagued the X-18 including being susceptible to wind gusts when the wing rotated, acting like a sail. In addition the turboprop engines were not cross-linked, so the failure of one engine meant the airplane would crash. Thrust control was through throttle changes, which were too slow for acceptable height and roll control. On the 20th and final flight in July 1961, the X-18 had a propeller pitch control problem when attempting to convert to a hover at 10,000 ft and went into a spin. The crew regained control and landed, but the X-18 never flew again. However ground testing of the tiltwing concepts continued. Eventually a VTOL Test Stand was built on which the X-18's vertical takeoff and landing and hover control was to be tested. One engine run was successfully conducted to the full 15-foot wheel height on the VTOL Test Stand. The program was cancelled on January 18, 1964 before further VTOL Test Stand testing could be conducted, and the X-18 was cut up for scrap. cross-shafting between the engines was necessary in order to avoid loss of control in the event of an engine failure. direct propeller pitch control was necessary for precise height and lateral control during VTOL and hover. This knowledge was employed in the successful development and flight tests of the Tri-Service XC-142A, tilt-wing VSTOL transport. ^ a b "1957 USAF Serial Numbers". joebaugher.com. Retrieved 19 February 2016. 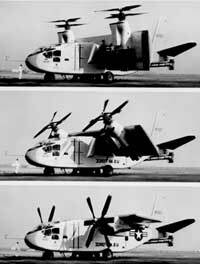 ^ "Hiller's Tiltwing Transport if Largest VTOL Transport. "Popular Mechanics, March 1959, p. 107. ^ "The X-Planes". Retrieved 5 September 2016. Wikimedia Commons has media related to Hiller X-18. This page was last edited on 20 February 2019, at 16:42 (UTC).